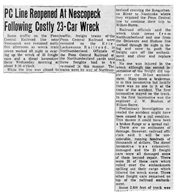 PENN CENTRAL WRECK - These two pictures show the damages the result of a Penn Central derailment at Nescopeck this morning. Damages will be heavy as powerl ines came down when an engine and 23 cars were derailed. Diesel fuel was spilled over a wide area and 2,000 feet of track was torn up. 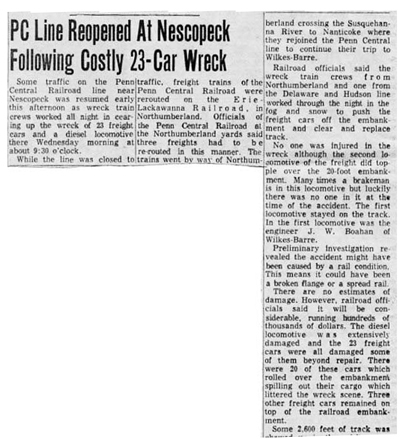 A diesel locomotive and 20 freight cars were derailed and rolled down a 20-foot embankment this morning at about 9:30 o'clock on the Penn Central Railroad line near the Broad St. crossing at Nescopeck. No one was injured. Damage is expected to run into the thousands of dollars. 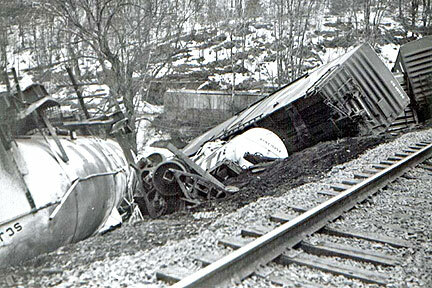 Wreck train and crew were dispatched to the wreck scene from the Northumberland yards. A second train to approach the wreck from the Wilkes-Barre and has been summoned from the Delaware and Hundson line. 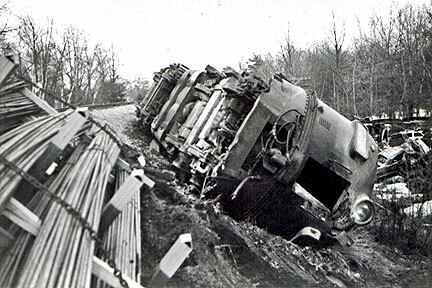 The derailed engine and freight cars were part of a 75-car freight train carrying miscellaneous freight. 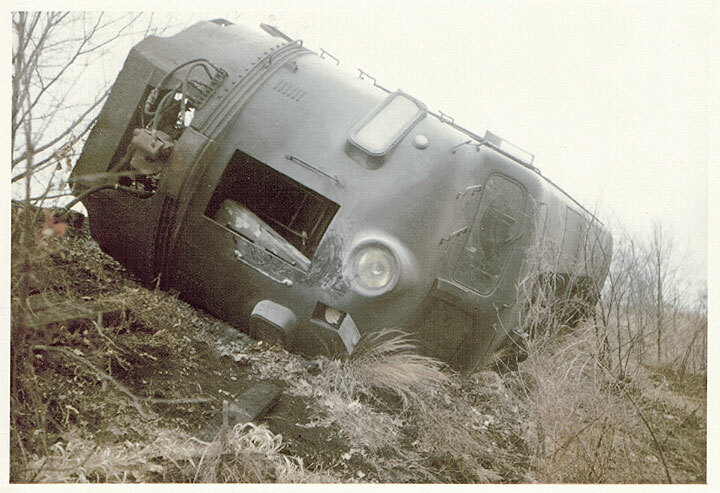 The train was described by railroad officals as S-82 traveling east out of Enola. Cause of the derailment was not known this afternoon as wreck train crews began the job of retracking the cars and making repairs to the 2,000 feet of track torn up in the derailment. 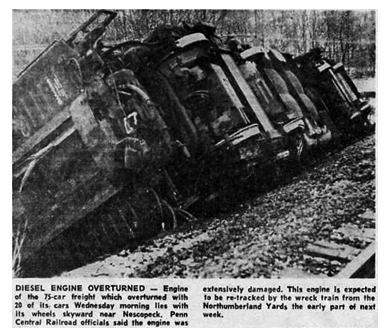 The second locomotive in the train was derailed and rolled down the 20-foot embankment on the opposite side from the Mifflinville-Nescopeck road, which parallels the track at this point. With it the engine pulled 20 freight cars over the embankment. 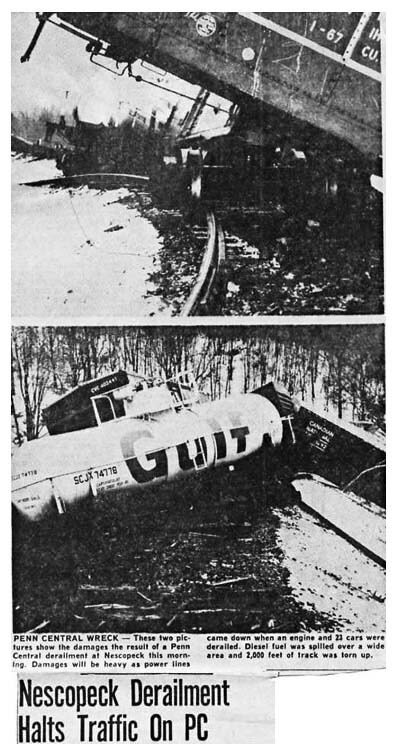 Fuel Spills A qualtity of diesel fuel was spilled from the overturned locomotive and are fireman were called to was away the fuel, before id became ignited. Power lines were bowled over and a wide area was without power until the lines were repaired. There were no injuries however. 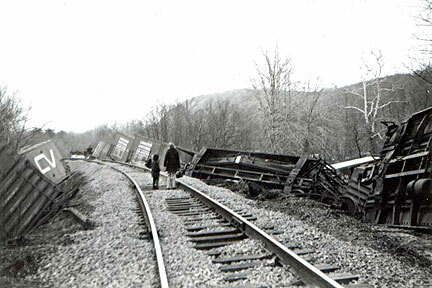 Three freight cars also damaged by the derailment remained on the top of the railroad embankment. Two of the cars which went over the embankment were tanker cars carrying ahcohol. However,, neither of the tanks was fractured in the mishap. 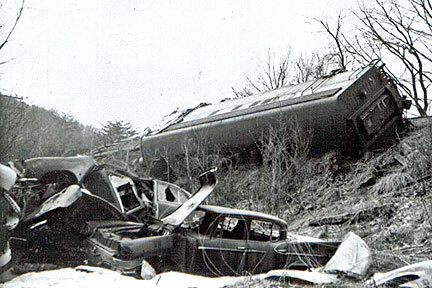 Some of theother cars carried miscellaneous freight which was tossed out along the embankment. 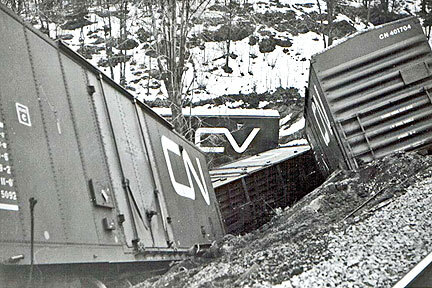 Several flat cars were carrying huge peices of steel reinforcements. The conductor of the freight was W.F. 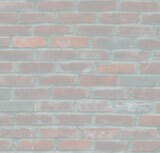 Merrill of Sunbury. The other crew members were from Wilkes-Barre. Service on the line will be closed until repairs are made. Freight running to and from Wilkes-Barre will be re-routed until repairs are made and the line re-opened. It was not known howl ong this would take.